We are manufacturers Badminton Court Roofing Shed. In compliance with modern market norms, we are actively involved in rendering a wide spectrum of Prefabricated Structure Designing Services for our customers. Provided services rendered using premium quality tools. Apart from this, we are providing these services within the stipulated period of time. We are amongst the most reputed names in the industry, offering PEB Structural Shed. We are engaged in offering a huge array of Summer Hut Shed to our customers. 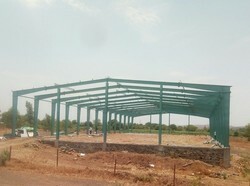 As a Structural Consultant, Safe was involved performing analysis and design of PEB frame for the horizontal extension of Industrial shed at Gandhidham. Scope also included preparation of Structural detail drawings.